JetPack is no doubt the best plugin out there with almost all WordPress.com functionality. It comes with almost 40 different functionalities, I would say small plugins which works best across all the sites. We used it on Crunchify.com for some time but because of some performance issue we stopped using Jetpack on Crunchify. No doubt we use VaultPress as our complete backup solution but it doesn’t need Jetpack once you register for your Jetpack plan. You could remove Jetpack once you activate VaultPress. As part of weekly WordPress Database cleanup process, while doing WP_OPTIONS table cleanup we noticed almost ~2300 _transient_jetpack_ records. 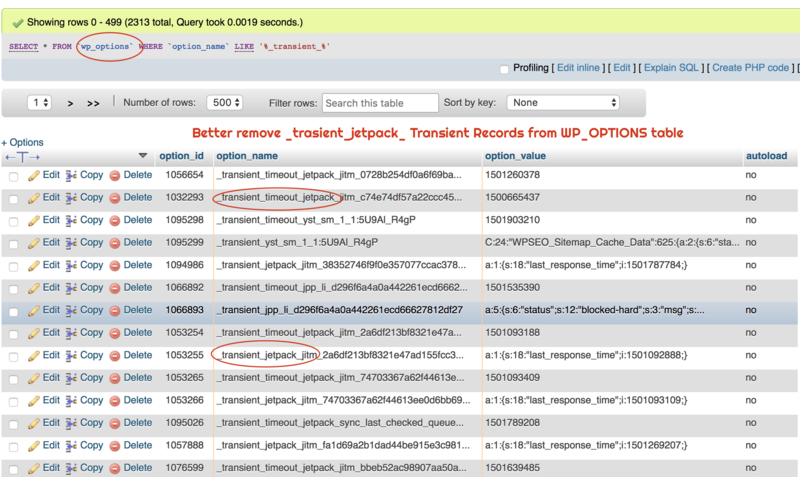 Surprisingly during Jetpack uninstall process, plugin didn’t cleanup those _transident_jetpack_ records by itself. You have to do it manually. As you see in above image, Jetpack adds lots of _transient_jetpack_jitm_ and _transient_timeout_jetpack_jitm. JITM stands for just in time messaging which Jetpack uses internally. Follow below steps to get rid of all unused _transient_jetpack_ data. On next screen, you will see all records with contains _jetpack_. Simply select all and delete it. And you are all set. Removing unused data from table will improve your WordPress site performance and will help you speed up your site. I would strongly recommend all my readers to monthly revisit phpMyAdmin and perform DB manual health check. Happy blogging. How to auto delete WordPress _transient_ Variables on Post Publish?